My summer seems to have been lost amidst a jam-packed schedule of weekend travel for work and rainy Florida weekends, much more rainier than I remember previous years being. With the rain finally starting to ease and hints of Fall in the air, nothing sounded more appealing than a fun-filled daycation at the Loews Don CeSar on St. Pete Beach with a girlfriend – after all, what’s the point of living in Florida if you aren’t going to venture out and enjoy it, right? 1. Brunch at the beautiful Sea Porch restaurant. 2. A VIP cabana on the Don CeSar’s private strip of beach. Firstly, if you’ve never heard of the Loews Don CeSar on St. Pete Beach, you’re not doing life right. 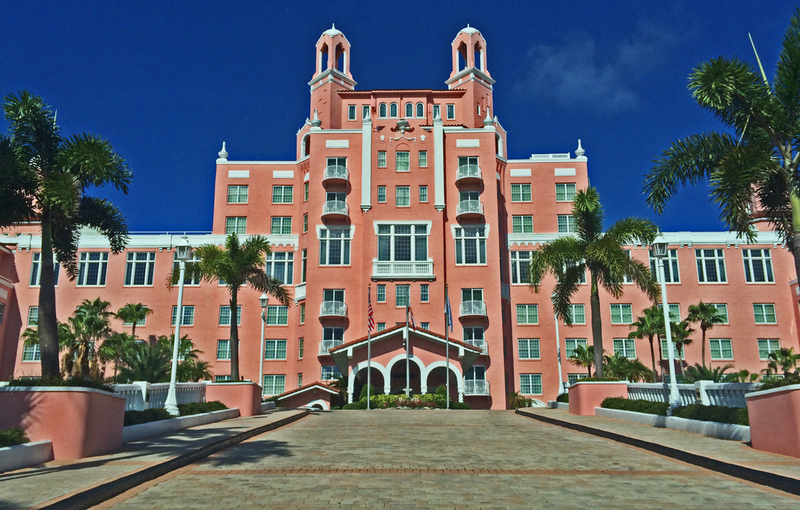 Take a look at this stunningly beautiful, Pink Palace and picture yourself enjoying a daycation here! The Sea Porch Restaurant is located inside the Loews Don CeSar on the ground floor, right by the northern pool. Brunch is offered Saturday and Sunday’s from 11am – 3pm in a very laid back, casual atmosphere with a cool beach-vibe. If you’re wanting an outside table, I recommend making a reservation as these are extremely popular, especially on a gorgeous, Fall morning. There is however, ample seating available inside the restaurant. If there’s one thing Maria and I can do well, it’s eat. 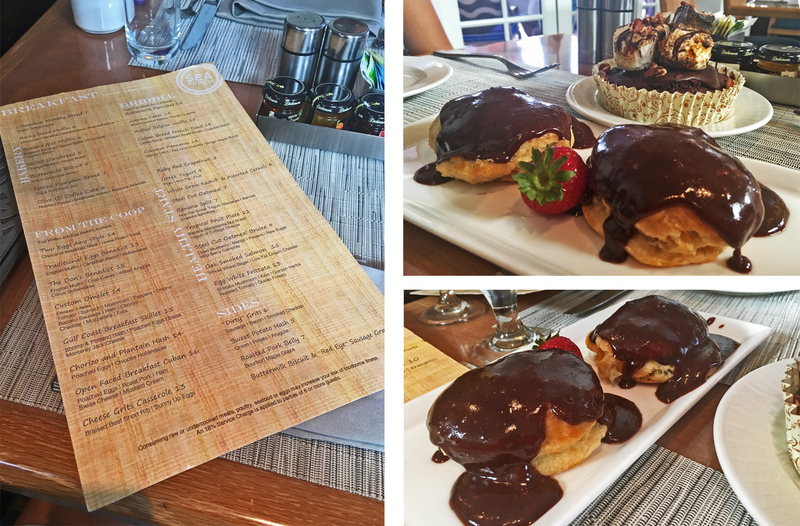 We had quite the sweet tooth on this particular Saturday, so we decided to kick our brunch off with an appetizer of everything chocolate – a Rocky Road Muffin and Buttermilk Biscuits with warm chocolate gravy. The toasted marshmallows on the Rocky Road Muffin coupled with the praline pecans and caramel were a treat to the tastebuds and the sweet, chocolate gravy erupting a-top the flaky, buttery biscuits was absolutely divine. 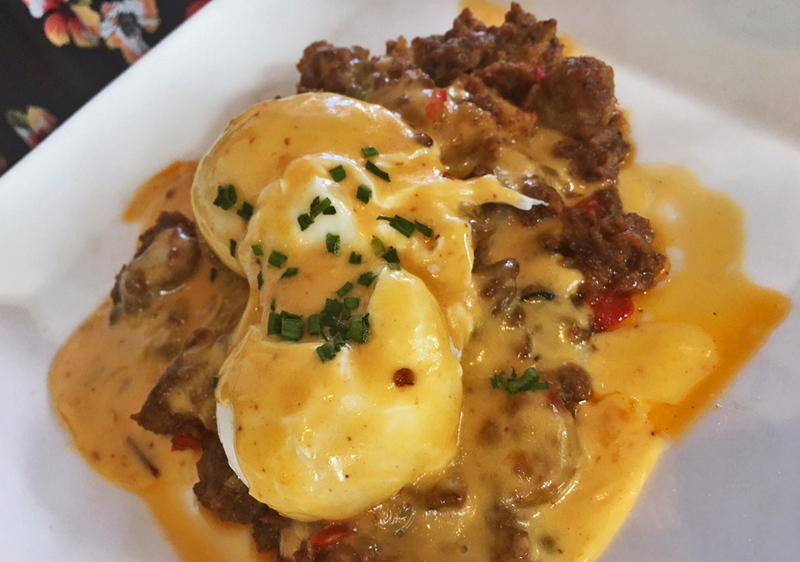 Next up was our entree – I went with the Open Faced Breakfast Cuban and Maria went with the Chorizo and Plantain Hash. Of course, our friendship wouldn’t be complete if we didn’t share meals, so we each tried each others before nodding in agreement at our selections. My sandwich was on point – two poached eggs, roast pork, ham, swiss cheese and mustard cream a-top open-faced Cuban bread with a side-serve of super tasty breakfast potatoes; the pork was delicious. Maria’s Chorizo and Plantain Hash was also quite tasty and full of flavor, albeit quite rich and heavy. 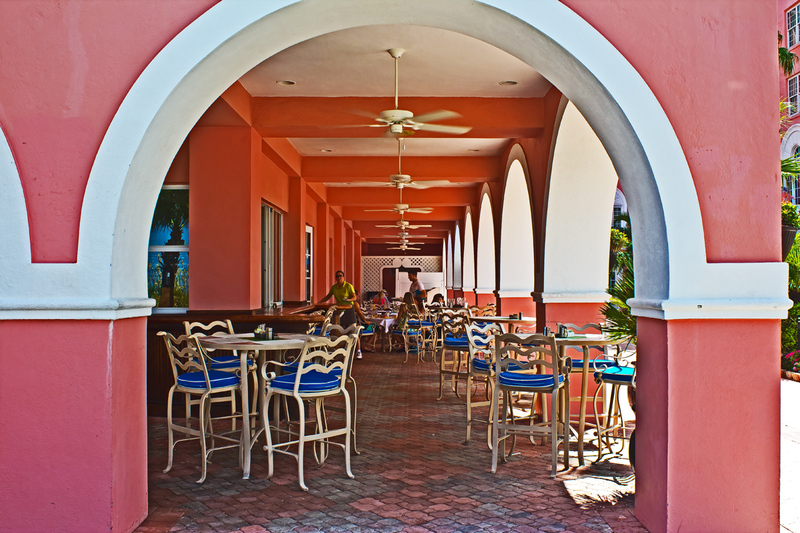 No brunch is complete without some adult bevvies and the Sea Porch provides a great selection. If you’re a Bloody Mary fan, I hear they have quite the Bloody Mary bar, too! We started our morning off with a couple of mimosas, switched half way through to Peach Bellini’s and then capped off our brunch with my personal favorite, the extremely delicious Morning Punch made with pineapple, orange and lemon juice, mango puree, banana liqueur, Bacardi Rum and Myer’s Dark Rum – so sweet and good! My only brunch regret – not ordering the Monkey Bread. We had this during our last trip to the Sea Porch and it is by far one of the most delectable brunch starters ever in the history of brunch. With our bellies full of food and feeling quite content, it was time to hit the beach, take a food-coma nap, and catch some rays! The Loews Don CeSar hotel provides front-door access to their very own private stretch of beach. Rows of beach chairs, umbrellas, luxury beach beds and cabanas are lined up across the sand and are available for rent at a small price. The weather was perfect for laying out – a little overcast so that the sun wasn’t insanely beaming down on you, but still hot out enough to enjoy it… and no rain! We were treated to a VIP beach bed – this consisted of one queen-sided bed with a half-shaded hood on top if you didn’t want the sun in your face, and two additional beach chairs if you felt like soaking up the rays from head to toe (towels were also included). The beach bed was so comfortable that I accidentally fell asleep on it for two hours – so did Maria. Talk about full relaxation mode! The Loews Don CeSar also rents out water sports equipment (both non-motorized and motorized) at the kiosk they have set up on their beach. The wind levels along the Gulf were a little too intense on the day of our daycation at the Loews Don CeSar so all water sports has been temporarily disabled, however you can usually find kayaks, waverunners and SUPs available for rent if you’re looking to be a little more adventurous. 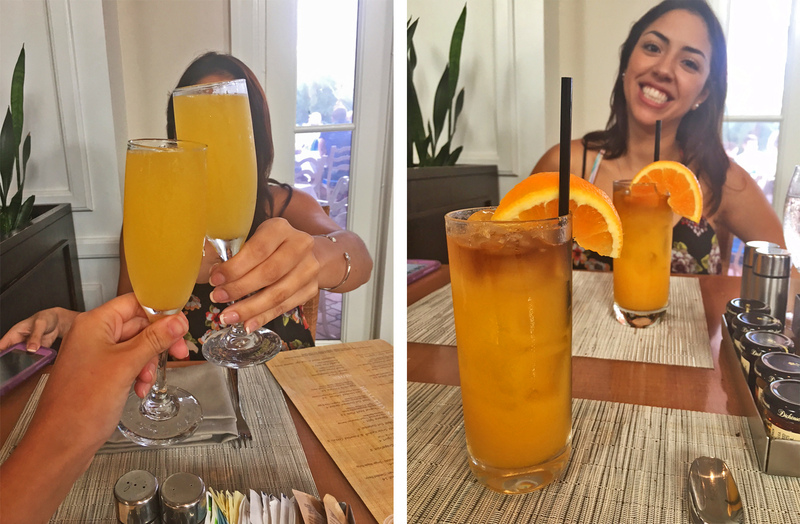 If you’re a local to Florida or even just visiting and looking for something a little different to do rather than spending another boring weekend at home, grab some friends and head out to the Loews Don CeSar to enjoy a daycation full of great food, drinks, sun and relaxation – you won’t regret it! *Loews Don CeSar Hotel kindly provided us with a complimentary brunch and beach bed, but all opinions are my own. It is informative . Thanks for posting . I’m a fan of beach and Loews Don CeSar beach is just so interesting, also their beach chairs, umbrellas, luxury beach beds and other gimmicks. Would love to be there one day. 😉 Thanks for this info! The food though!! Looks amazing.. I’m walking/riding buses/trains around the U.S. in a month or so. Looking at all these awesome pics is making me really excited to get going! Thanks for sharing, awesome blog!